Seventeen-year-old Roger Starnes with the simple computer he started building when he was 14. ROGER (17) BUILDS A COMPUTER! ONE of the most unusual features of Winsford Rotary Club's Hobbies Exhibition which opens at the Civic Hall today (Thursday) is a computer constructed by a 17-year-old Verdin Grammar School pupil. Construction started when the boy, Roger Starnes of 14, Spring Bank Crescent, was only 14, but the computer has been improved and modified during the past three years as much as time and money would, allow, and he celebrates his 17th birthday today at the exhibition showing off his brainchild. Said Roger: "It is an expensive	hobby, but I get my parts from Army surplus and junk shops." His interest in electronics was probably stimulated by his father, Mr Kenneth Starnes, chairman of the Mid-Cheshire Amateur Radio Club, who are running the stand on which Roger's computer is being exhibited. Of his exhibit Roger says: "It can add and subtract at the speed of electricity, by selecting numbers with a telephone dial and is the basic form of a computer." Although it can only add up to 256 At the moment, with every stage added to the computer circuit its capacity can be doubled, and it can also multiply by repeated addition. Roger hopes that ht will be able to go into the computer industry when he leaves school - and with this project under his belt he should have no difficulty. 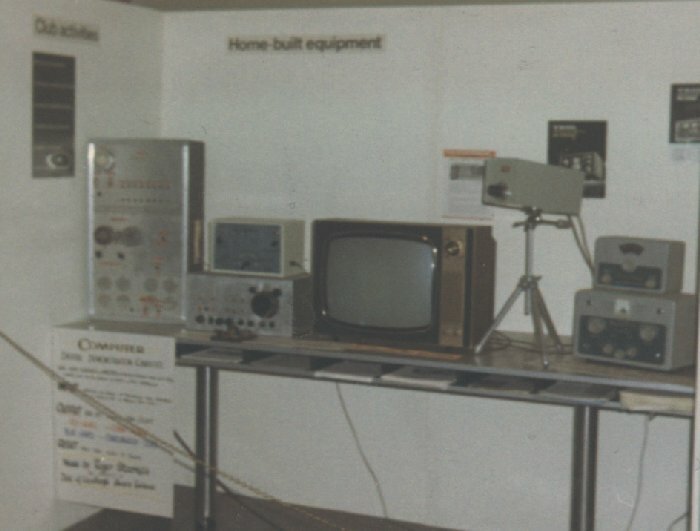 This display shows a home built computer and ATV equipment (A Thorn TV). We now know that the computer was more special than at first guessed: It was buit by Roger Starnes and his father Ken in 1968 when Roger was 17. This contributed to Roger earning his Duke of Edinburgh's Bronze Award and was reported in local and national newspapers: "Roger, 17, builds Computer". The computer could add up two 8 bit numbers represented on the bank of 8 LEDs. The upper row of dots visible on the photograph is probably a row of switches for setting the bits and over to the left some switches to select the operands for input and to display the result. The tape section is installed but not working. This may have been paper or fax tape. This digital computer was built almost a decade before computer kits would become commercially available heralding the home PC revolution. Roger is now a highly skilled computer controlled robot builder, aeromodeller and model gas turbine builder.